One of the most important aspects of diet I try to teach my little one is that everyone is different – Diet and what we chose to eat is up to an individual. At home we are vegetarian and at times Whole30-challenged vegetarians. I don’t eat meat but outside of the house, I feed her meat and fish, as long as it is good quality, preferably locally sourced. When she grows up, she can make conscious decisions about her diet, all I can do and lay a foundation, offer her choice and teach her that diets are personal and as a result she may eat differently depending on where she is. I also know that if we are too strict with our diets then we lose interest in food or eat that which is not good for us. 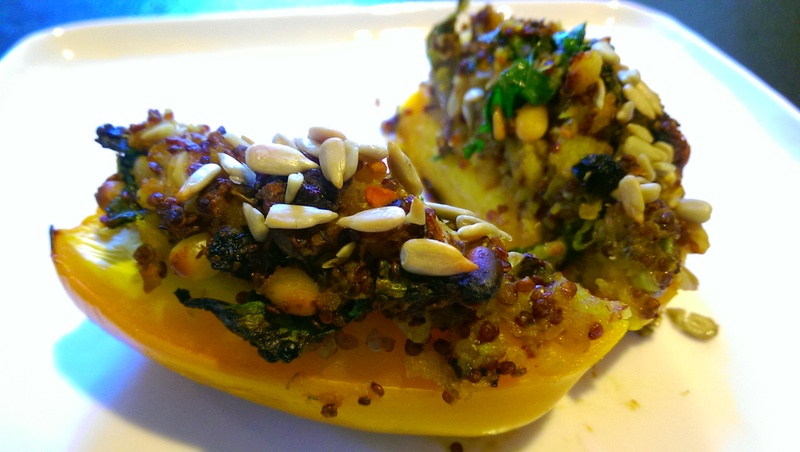 As a vegetarian, the Whole30-like diet without legumes and quinoa can be a bit daunting. I have learned a lot about myself and my tendencies with regards to consuming these foods, but that does not mean I buy into Whole30/paleo mantra against it, just like I don’t believe that the amount of meat the diet suggests is environmentally or physiologically (if not sourced well) sustainable in the long-term. Nothing is wholly good and nothing is wholly bad. Everything – even water and oxygen – must be consumed in moderation. 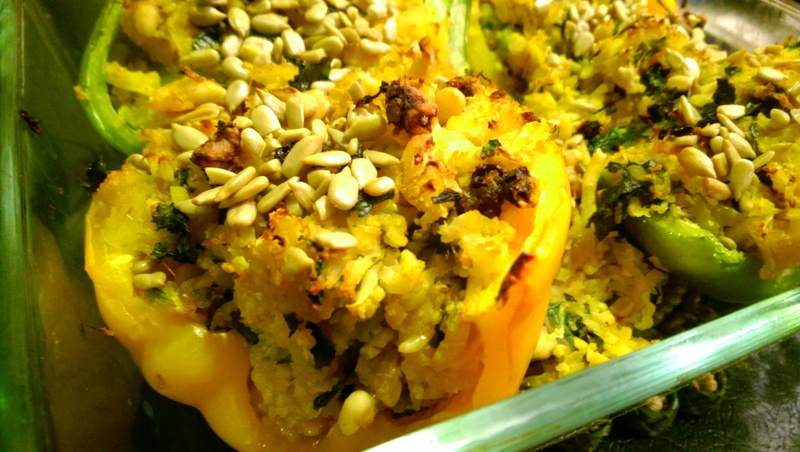 I have not eaten quinoa or legumes in months and I thought it was time to offer up a choice when making stuffed peppers – quinoa or riced cauliflower, because, well, why not. Both were tasty – so I suggest both varieties. The choice is yours. Saint Patricks’s day was earlier this week. To tell you the truth, I don’t know much about it other than it is an Irish tradition, you wear green and eat and drink a lot. 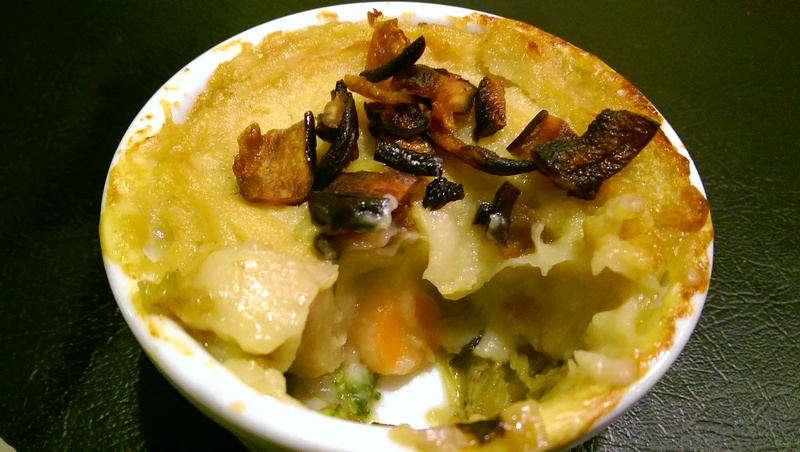 So I put on a green skirt, cracked open a beer and made a classic Irish dish my way – a gluten-free, dairy-free, meatless, legume-free Shepherd’s pie with veggies, mashed cauliflower and shiitake bacon.